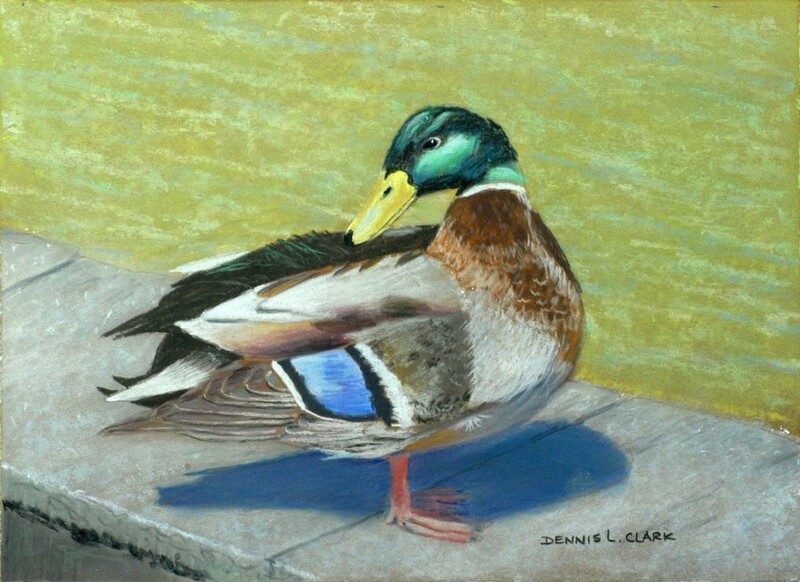 Even though there are duck with more brilliant feathers, the Mallard Duck has been one of my favorites simply because, I suppose, it has the one been most observed by me. Let’s capture this one in pastel. 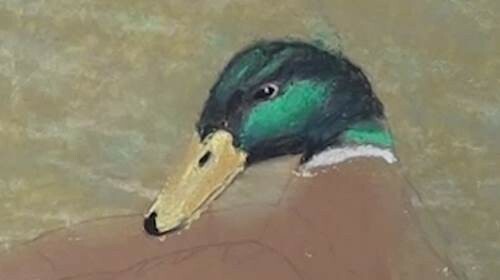 Block in some Yellow pastel for the base color and then overlay some Green and blend carefully around the outline of the duck. Stroke in some White and light Blue for the ripple reflections. Don't blend too smoothly as we want to show texture to the water. Lay a soft White over the concrete wall area and smooth out as a base color. Now, with either a Gray or a Black pastel pencil, begin to softly add the sunlit top of the wall. Darken up slilghtly for the edging and darker still for the overhang shadow. With a White pencil, add the highlights to the edge and also to indicate the roughness of the concrete. 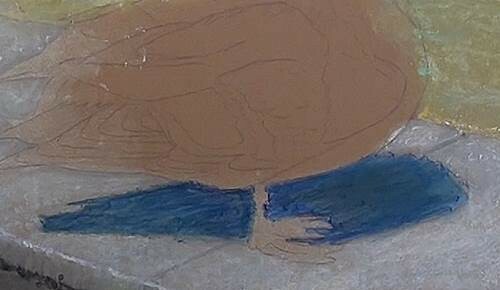 Add the Duck's shadow with a dark Blue. Remembering the principle of the brighter the light, the darker the shadow, slowly build up to the required shadow density. Don't forget to leave space for the duck's legs. 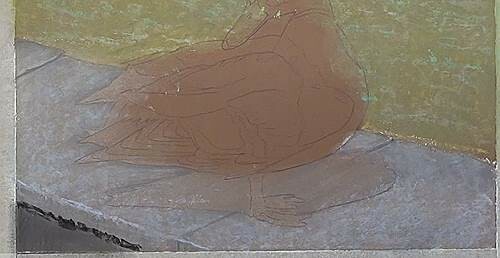 With Burnt Sienna, Yellow and Black pencils, begin to paint the leg that is in the sunshine. Only vaguely show the foot in the shadow area. 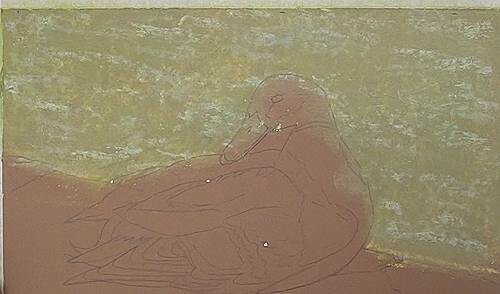 Block in the beak with a light Yellow pencil and do the shading with Yellow Ochre. Add Viridian to the green areas of the face. 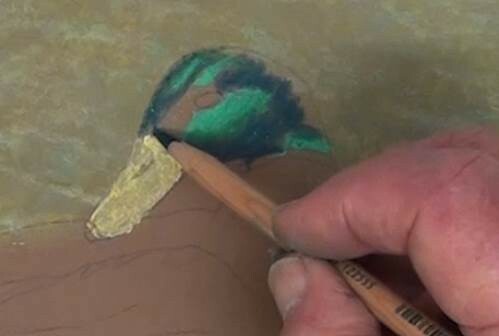 Use a very dark blue such as Pthalo Blue to paint in the rest of the face, and softly blend the lower edge of the large green patch. 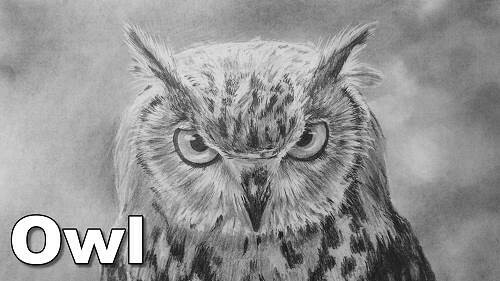 Finish off the dark areas of the beak, as well as the eye. With a White pencil add the white edging and the highlight to the eye. Add the White neck ring and then with Burnt Sienna and dark Brown begin blocking in the chest area. 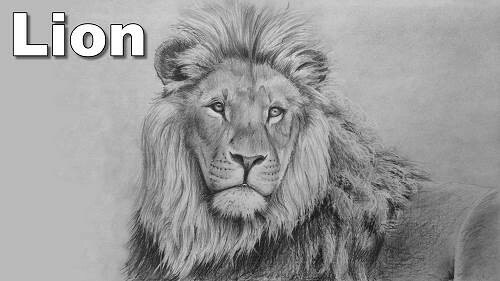 With a White pencil draw in the impression of feathers. Begin shaping in the wings with a Black pastel pencil. Use a soft White pastel stick to fill in the large white areas. Smooth out and then blend in the light brown areas with Burnt Sienna. 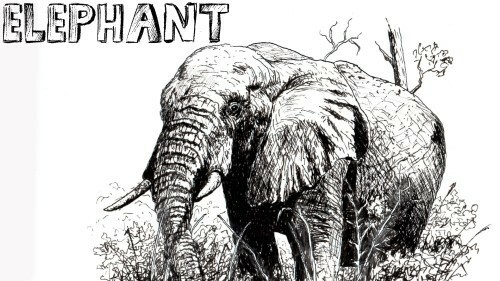 Subtle shading is added in with a dark Gray or Black pencil. With similar colors begin the nearer wing. 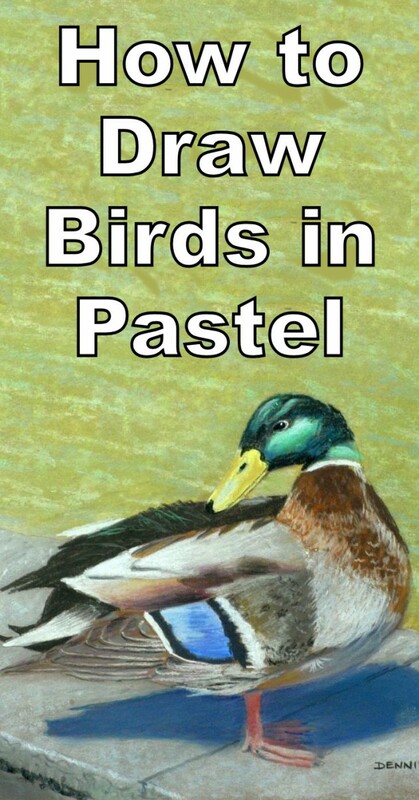 Loosely indicate the soft chest feathers with a White pencil. 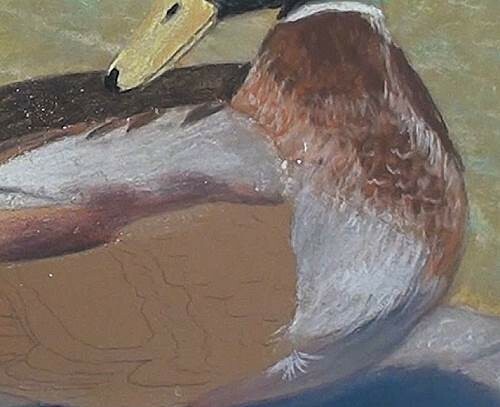 We need to shade in the moulding of the wing with a darker Brown value before we can begin to paint the lighter marks of the wing feathers with a White pencil. 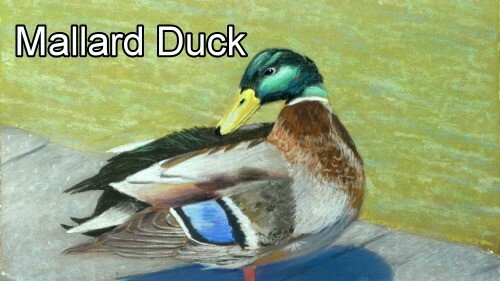 We now start to paint the characteristic marking of the male Mallard Duck. 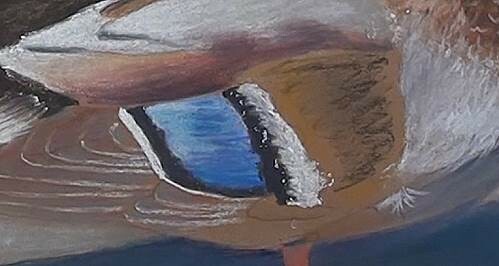 After adding the White and Black edging, slowly build up the Blue area by painting in some soft White and Ultramarine Blue and then blending together with a White pencil. Carefully add more Ultramarine for the shadow on the lower portion. Also draw in the lines dividing the feathers. Edge off the right side with Black and White. 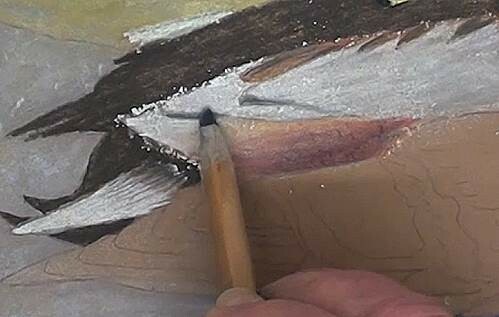 Darken up the shoulder of the wing and smooth down with a paper stump. Indicate the small feathers and with a Black pencil. Deepen up the shadows of the wing feathers to give them depth.